My forum and chat name is Oldbefana, and my daughter Virginia will be calling in. Our area code is 712, location Council Bluffs, Iowa. She has not been to any readers or rootworkers before and has never been on the show. Her question: "I am just beginning my college career and am drawn to religious studies. I need to know if I am on the right path to use what talents and gifts I have, not only for my happiness but also to serve others. I am taking a class with a great archaeologist, have made appointments with department heads, and am doing all that I can on the mundane level. Some family members are trying to push me into medicine, but I do not feel drawn to it right now. Hoping for some divination and rootwork advice to help me discern the path that I should follow." For January 27th. This week's special Guest Member from AIRR will be Lou Florez!!! Lou is in Guernerville, California y’all! 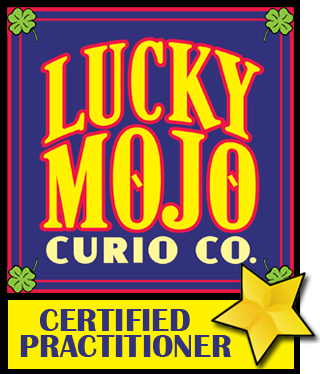 My Lucky Mojo Forum name is becca7417 and my Blog Talk Radio caller name is Becky. My area code 254 and I am calling from De Leon, Texas. I have never had any readings with ConjureMan Ali or Catherine before, either privately or on the radio show. I have not gone to other readers or rootworkers about this situation, but I did post it in the forum. I have been seeing a man off and on for 7mth, He was up front from the beginning about not wanting to committed saying he needed to get his life together before he committed and the next person he commits to will be his best friend. On Dec 11th I told him that I loved him, but I did not know how long I could keep going this way and I was not happy with him seeing other woman. The next day on 12-12-12 he textes me and says he should have said it the night before but he loved me and did not want to lose me. That was the only time he has ever said it. Since then he has been pulling back and forth from me, also never getting rid of all the other woman. He also spends alot of time alone saying he is getting his life together, but then he just sits there doing nothing. We had a bad discussion one night and I told him he pushes the people away that really love him and he says that's what he does. He is distant from his family too. On Jan 7th. I started a Honey Jar and made a Doll Baby and week later I started a Red Skull. I work with these every night. Also each week I go to his home and sprinkle Peony, Love me and healing powder and put Healing and Peony oil in his body was and shampoo. This week I added my dry monthly to his coffee can. He is some what opening up more and I feel we are coming closer, but then there still the other woman. He says the attention is like a drug. Last night I made a freezer spell using a lemon and alum on the love rivals. I also bound and pinned the Doll Baby. Last week 10 min after doing his house a Bee flew in my truck and just buzzed from my face to the bag that I had the powders in and the flew off. This week it happen again, but the bag was not there this time and it was before I did his house. I love this man and I don't know what else to do. I will hopefully be on the show Jan 27th. 6) Please give us a brief description of your situation (please be brief! ): I am calling for an update on a prior radio call. I had an insecure boyfriend and was advised that I should run (rabbit foot) and that he was tempted to cheat, not stable, etc. I did some work on him at that time but decided to walk away from the relationship. We had not contact up until the last month, he keeps emailing me on facebook and has asked to be "friended" again. I have not made any effort to communicate with him and have not friended him. I have met someone new and had the most unforgettable 1st date of my life with him last night. Wow. Would be nice to know where this is going and what type of work I should do. Yet again...long distance and he lives almost 2 hours away. I want to get a jump start on this one! Please remember to copy and paste these following questions from nagasiva's original post, and fill them in as completely (and briefly) as possible. This makes my job moderating and editing the posts (right before the show goes live) that much easier. Thank you for your understanding. Hello, I have never had a rootwork reading conducted with Lucky Mojo or anyone else and plan to call in tonight. My caller name is Belle and my area code is 773 from Chicago. My question, I have had years of bad luck and wondered if there is a root cause of all of this? Can you shed some insight? This started in college and, since then, I have been on a path that seems to continually lead to failure in whatever I do--romance, career, etc. Am I imagining things or is there a root cause?